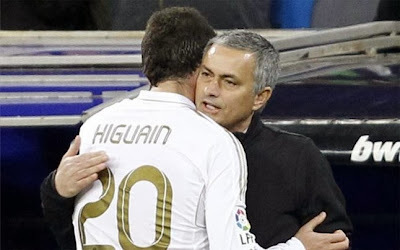 MOURINHO ON HIGUAIN: "A player I know we cannot get!" Chelsea fans around the world have woken up to reports of an "official" Chelsea bid for Gonzalo Higuain being rejected by Napoli. When asked of these reports, Jose Mourinho had denied any bid was made at all! Jose Mourinho continues to re-iterate to everyone that he is happy with his squad and his strikers but the press are still convinced that a move will be made! Late last night, The Telegraph (a trusted source) reported that a bid of £50m had been made and rejected by Napoli for the Argentine striker as Jose Mourinho looks to re-unite with a player he knows well from his time in Madrid. He is a player I know we cannot get. Napoli want to win the Scudetto, they want to win the Europa League. I don't believe they are interested in selling Higuain. As I said, Mourinho continued to state that he is happy with his current squad and he believes that the squad is good enough to achieve their objectives for the current season. Now £50m is a hell of a lot of money once again and after the club posted losses of around the same amount this week, you do have to question the substance in these reports. In our last two games, Samuel Eto'o and Fernando Torres both got on the score sheet to do themselves a power of good. Demba Ba comes in and does well and has picked up a goal or two also. The way Chelsea play now you have to believe that there scoring drought is over and all three will score goals when they are involved from now until the end of the season. As much as it's being reported, I personally cannot see Mourinho making any moves for a striker at this stage. However, if interest in Demba Ba is made official, Mourinho will have a decision to make. This summer will be very different however. Mourinho keeps talking about making two critical signings to take the team forward and one of those will be a striker as Demba Ba looks like leaving then if not before the close of this window and Samuel Eto'o only signed for a single season. The prospect of Fernando Torres, Romelu Lukaku and one other big name striker is something we have to wait to look forward to. For now? Jose has re-iterated once again he is happy with his current three so I see nothing in these reports of Higuain even though his is world class in my view. What do you people think? Are you happy with our current three now? What do you think of these reports that we have had a £50m bid rejected if it is in fact true?